Robin Hooper is an actor, writer and director. He has acted on stage, television and film. 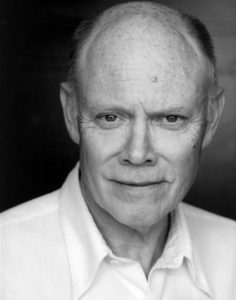 He has had a long career as an actor, working with the Glasgow Citizens and the Liverpool Everyman early in his career. He has worked in television regularly, appearing in Love Nina and The Office on the BBC. More recently he has returned to writing for the theatre and has directed his own work. Robin has also been Literary Manager at both Paines Plough and the Royal Court Theatre. PC: How did you fall in love with theatre? RH: I think basically there wasn’t anything else. PC: What do you mean by that? RH: I’m from Bilston, which was then, in the fifties, a Black Country market town and there was very little that I found interesting. I was completely, more or less, not fitting in, with anything. Hopeless at sport, not particularly academic. I liked puppet theatres that came to my primary school. Also, one strong memory I have was, Bilston used to have a beautiful old theatre which, when I was about 11, was demolished. My brother and I were walking home from school over the remains. We were treading on fallen flats and painted cloths. There was rubbish and lanterns and bits of old ceiling and goodness knows what. That is a very strong memory. Then I just started to get really involved in performing plays because it was the only thing I could do. It sounds naff but I think it was all about seeking a kind of approval, being an outcast and isolated. I think, until fairly recently, that has been the subliminal mission: to seek approval by doing something. Live theatre gives you a real injection of that. If you get to be known, and I am not really known at all, but if you get to be known just a little and you’re recognised and people come up to you, initially anyway, until you really start to look at it, it is about this thing of: well I’m valued in some kind of way. Then I think as you grow up and think about, and you have to, if you like, re-examine all that, then you realise it has to be about something else. And that, to a certain extent, I think is when my more recent work came in, you know, the developing of plays, the writing of plays and stuff like that: being interested in texts, because it is much more grounded, than this idea of performance. It is wonderful that, and I am now being reminded again of this very sensual thing about playing a play like this (A Month of Sundays, Queens Theatre, Hornchurch), which can be very funny and very touching with a live audience; you have this real connection with an audience and I know people go on and on about it but it is the only thing of any real value. Actually it is real control for the actor, when the director has gone, maybe the friends and producers and you’re on your own with other actors, for a run of a play, and there is just nobody around other than the audience of the place, the area, that you’re playing in. It’s a wonderful opportunity to connect and that really justifies the sacrifices that you make. Very few compared to the sacrifices most people have to make. But like, you know: not very much money; poor audiences sometimes; gruelling tours etc. etc. RH: Very unsociable hours. There is that wonderful story that I heard on Radio 3 a few years ago, when, I think an actor, or a writer who was thinking about being an actor, was talking to his mother, I think they were, sort of grand people, and she said, “Darling, you’ll find it will cut into your evening.” And it does! It does bloody cut into your evening. PC: Did you find approval quite quickly during your school days? RH: Oh yes because the PE teacher, who I didn’t get on with at all because I was so useless and you know he humiliated me a few times in PE etc. And God when I playing Gertrude in Hamlet, in the school play, the whole dynamic of our relationship changed and he began to treat me differently. I mean, I recognised this at thirteen. Then, because it was an all boys school, I built up a kind of fellowship with older boys with this material that was very sophisticated. We did T.S. Eliot, a lot of Shakespeare, Charles Williams, you know we did serious stuff. PC: But you also described yourself as not very academic. RH: I’m not. I’m not really. PC: So how do you feel you were able to access that kind of work? RH: Through wonderful teachers that shone in the English department. We had very good and very sensitive and very industrious English teachers then in the sixties – Ronald Sterry and Graham Mathers to name but two. They wanted to get these kids from the then industrial West Midlands on to the stage. For goodness sake, most of the roles that I played at school were drag and there was no embarrassment. It is a very curious thing that happens sometimes at certain schools. Even though it was not geared towards the arts, the school I mean, we were never mocked as a result of being in the school play. Not at all. Largely because most of my friends would have been terrified. I wasn’t. It was such a particular world, again quite isolated but, oddly enough, it connected me to where I wanted to go to. PC: Was there a sense of escapism about being in the plays? RH: Totally! Totally. I mean I was on a completely different planet when I was in school plays. And actually when I went to Manchester University I had three amazing years where I was doing a lot of very, very different things but all related to the theatre. It wasn’t just a little pin head of a subject anymore, it was my whole life. I had the most amazing time: we had incredible people to show us their work, including Grotowski, and my professor, Hugh Hunt, who directed at the Old Vic and the Abbey in Dublin. Our university theatre was also occupied by the then Theatre 69. It was the most wonderful time. What happened after university was I tried to repeat this very sensual escape and mission for approval, in companies like the Liverpool Everyman theatre, which was very hot in the seventies and the Glasgow Citizens theatre, even hotter as regards their choice of classical repertoire and design, and the Half Moon theatre in the East End of London. There were others too that I really had to be a part of because it was repeating, in a kind of hands on, in a professional way, this real strong element of escape and connection and actually using the imagination. I mean at university I didn’t just act in plays: we wrote plays, we designed plays, we talked about plays. You know, people, who were a little older than me, like David Edgar writing plays for us to do. So it was very, very highly charged. In a way, my whole career has been about trying to get that kind of work going or being a part of that work, and that’s what took me to the Royal Court eventually, and Paines Plough before, as literary manager and I acted there as well including Howard Brenton’s Bloody Poetry directed by Max Stafford Clark. This was a very, personally, a very difficult but instructive period for me. But certainly I thought to myself, “I’ve got a mortgage to pay, I need a regular income, I’m going to try and get this job at the Royal Court as the Literary Manager.” I tried twice and I thought I am going to be a part of this building if it kills me. It had a very creative output and atmosphere which is very specific and is, in a way, going to stretch you. Very different, but as exciting as the Glasgow Citizens and the Liverpool Everyman then. And I mean, you know, in Sloane Square, massive, international, global reputation and you’re part of that. When I was there, that is when I seriously thought, “Now, you’ve got to try and write plays.” I had written plays before and had one or two on, but I thought no, you’ve really got to focus on playwriting. Because again, you know, you’ve got to expand, not necessarily career-wise, but you’ve got to test your imagination, you’ve got to make this thing that you have considered to be so important. PC: What was your day-to-day job as literary manager? RH: It was basically, you have a department, you have your own department. The last 18 months that I had, thanks to Stephen Daldry, who was the new boss then, I had the most wonderful office, I had one of the best offices in the building. But it was quite apart from the real artistic corridor. It was immaculate. But the job did practically kill me. Whilst I was there we found some extraordinary writing, not least of all Sarah Kane, Mark Ravenhill, and Joe Penhall, you know, and those were the babies. Then we were working with the grown-ups, Caryl Churchill, Timberlake Wertenbaker, Terry Johnson, and David Mamet. It was basically finding the plays, dealing with all the scripts that came in and I think then there was something like two and half thousand plays coming in a year, if not more. Also the job involved writing script reports. We had a weekly script meeting that I had to chair. We had international obligations, led by Elise Dodgson, whereby I went off to Tel Aviv, Berlin and Singapore with writers. Doing workshops. Showing their plays. Little scenes from their plays. Expanding, expanding all of the time. Really working with the writers on their plays. I mean the director always had absolute authority and spent much more time with the writers than the literary manager did. But then the, this getting together of the script panel and the organisation of the script reading which was rooted in Max Stafford-Clark’s initiative, who founded this grid system whereby we had a grid with plays on and every week the grid was copied and you voted on. Fifteen, twenty plays, more, a week. It was terribly organised, it was your responsibility that that was happening. The joys were meeting and talking to wonderful writers about their plays very early on, like Kevin Eliot, about his My Night with Reg for instance. Keeping all that boiling because the directors have to focus on their productions and getting money and getting grants. I was very relieved that the financial side of things were taken out of my hands really, in the sense that I didn’t have to pursue the money issues that Stephen and others handled to try and get productions financed. My responsibility was making sure that plays got read and distributed around the building, meeting writers and going to the theatre, just seeing, exclusively more or less new work which takes up a lot of your time. PC: What did you do once the writer was invited into the theatre? Workshops? RH: I didn’t really do the big, big workshops. I did little workshops with younger writers, less experienced writers. I mean Sarah Kane was a little like that at the time. You had directors like Ian Rickson, James Macdonald, Katie Mitchell, coming in to the building when I was there and they were just really establishing themselves. They were the ones that did the development. My job was to facilitate. I think it was because I was older. Generally ‘Uncle Robin’ would make things a little bit easy with these writers and directors. Because sometimes the directors were so focused on their productions and building their team that they weren’t making the writer feel secure. I mean, for instance, I knew Kevin Eliot before My Night With Reg, I’d met him a few times and I’d seen his early plays, but as a result of Reg happening at the Court and it being such a success, we remained friends for 20 years. It was less concerned with the production, it was more concerned with: “What are the problems you’re having with your plays? What difficulties are you having?” I mean, Kevin Eliot, for instance had no difficulty with Reg at all, it was an absolutely finished play, But, I mean, you know, there were younger writers like Sarah Kane, Nick Grosso, Judy Upton. I would just talk through their worries with them. But the main responsibility was organising the script panel, script reading, making sure that that department was run efficiently. PC: If you’re were one of those writers back then, what would be your expectations be of Robin at the Royal Court? RH: Well I would read the play first or I’d have it read by others. A play might come through which somebody thought was interesting and then I would look at it and I would decide more or less whether or not to put it on the grid or not. Or I would show it to another director and perhaps we’d both put it on the grid together. Then as a result of it going on to the grid a lot more people would read it and then a voting system, quite simple, but it seemed to work. Then I’d meet the writer, then meetings would be set up and I would organise those meetings with either myself or with directors and then the director might think, “I’ll have another look at another draft.” We might give them a bit of money. And then the play might get done. Not that often did it work so easily because you’re up against the big guns. We tried to get a lot of the young stuff in at the Court Upstairs. It was very, very rare that a first time writer got done Downstairs. There would, to a certain extent, be auditioned Upstairs first and then put Downstairs. You would hope that the Royal Court would be interested in the tone of your writing, what you were writing about, not necessarily this play but possibly another play, the next play and so forth. PC: What were the main differences between the Royal Court and Paines Plough? RH: The main thing that one had to acknowledge about the Paines Plough, and it is still going strong, it did not have a theatre. The Royal Court had its own building, it had its own theatre, it had two auditoria. Paines Plough didn’t have that, you know, it toured new work. It did co-productions it did occasionally perform at the Royal Court, more often than not other theatres in London would take a Paines Plough production. That was the main thing. There wasn’t a grid system at Paines Plough because we didn’t have so many plays and in fact they were very early plays of what would become established writers like April de Angelis and Stephen Jeffreys. The pressures were all to do with administrations and getting co-productions going and these tours. Getting people to see these plays, I don’t know, in Peterborough, Cheltenham, Exeter, Sterling, whereas there was less of that responsibility with the Royal Court because it had a building. PC: Paines Plough is a fascinating company in that it is truly national with the touring of new writing. Is there something that you looked for in new writing? You mentioned tone as important. RH: Yes. What you want, I mean this is my view, what you really want is you open up a play and read it and you think “I haven’t quite read anything quite like this before.” The choices the writer has made, the language, sometimes it can be the intelligence of the argument, the debate in the play. But more often than not it is this thing: tone, a term which I did not originate by any means, it comes from a very Royal Court way of looking at plays over decades from the 50s, to the 60s right through. I think it is a word that probably Gaskill used. One cannot underestimate the importance of the directors William Gaskill and before him, George Devine. Also Peter Gill, who was a playwright as well as a rather wonderful director and there were others. You became aware of a particular way, very particular choices. You didn’t want to look at something you had seen before, you didn’t particularly want to look at something that you immediately recognised the source material, “Ah, this is like a Pinter play, or a Shaw play, or a Shakespeare play.” You didn’t want that. You wanted to open up the play, and certainly with My Night with Reg because it was a play that was recently revived very, very successfully and will always stand the test of time, I think, is that you look at a play and it has got a very, very particular feeling or smell. And I think there are other writers that do have that to a lesser or greater extent. Sarah Kane, I mean, you know, with all its bluntness and its almost, like its vulgarity in a way, but she was making very, very deliberate choices which were derivative in my opinion, but she was putting it all together, in this, rather unchaotic way. It is to do with that really. I don’t want to use the word poetic but it does come in to it to a certain extent. It is like there is a new poetry in the way that the playwright’s fashioned his or her material. PC: It is similar to a certain extent when people describe stage presence: there is something beyond description about a play that you read for the first time, is it that? RH: Absolutely. I mean it is very sensual. The whole thing about live theatre is its sensuality. It is not literary really. Yes it can be studied and it can be written about. I am reading a very good book at the moment by David Riggs about Christopher Marlowe. It is very cleverly instructive, and an insight into his plays and his life. But actually the ultimate experience for anybody who is really interested in theatre is that you sit and watch, or hear a Marlowe play and it knocks your socks off. You cannot believe the muscularity and the brilliance of the verse, you just think, “Oh my God, where does this come from?” Or an actor comes on stage and you start watching this actor and you just think the same. It is very, very powerful. Yes sometimes I can’t hear you, yes sometimes you are doing it too much, whatever it is, but there is something there that is very, very special. Originality perhaps, I think more than anything, something I am afraid you can’t teach. PC: One last question. You have turned your hand to lots of things: acting, writing, literary management, what advice would you give to people who are interested in getting into theatre? Is it to be open to all parts of theatre? RH: Well, I mean, fortunately I have worked with Richard Wilson, and one of his favourite words is ‘open’. I think you’ve got to be open to possibilities and responsibilities since really there isn’t enough good work around, I don’t think anymore anybody should just specialise in one particular thing. I mean, we know that Shakespeare acted as well as wrote, but more than that, he was a very successful business manager. He and other actors were responsible for their own building, they chose the plays, they helped finance it, it was their income. I often say to young people, “For goodness sake, if you want to direct something, try and direct something! Or if you want to write, do it! Stop talking about it and do it. And fail and do it again; just try. Go for it and work bloody hard at being as diverse as possible. Do it all if you possibly can! But do it well.